In the design and analysis of reinforced concrete members, “The mechanics of members consisting of two materials.” To compound this problem, one of the materials (concrete) behaves differently in tension than in compression, and may be considered to be either elastic or inelastic, if it is not neglected entirely. 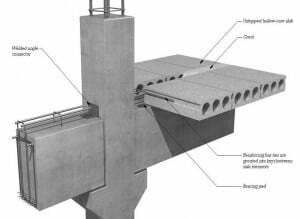 Which of the following philosophies are related to design of reinforced concrete structures? 2. In working stress method, tensile strength of concrete can be ignored. 7. Which of the following capacities are checked under Ultimate limit state ? 8. Which of the following factors are checked under serviceability limit state? 9. Working stress method does not give reasonable measure of strength, which is more fundamental measure of resistance than is allowable stress. 10. Vibration is checked under ultimate limit state. 11. Which of the following loads does not come under long term analysis? Mechanics of materials will allow us to relate stresses to strains. Sections will be in equilibrium: external moments will be resisted by internal moment, external axial load will be equal to the sum of internal axial forces. (Many new engineers overly impressed speed and apparent accuracy of modern structural analysis computational procedures think less about equilibrium and details).